Over mountains and deserts, ultramarathon racer Zach Landman '08 runs and runs until it hurts -- and then he runs some more. The motto of the Tahoe Rim Trail Endurance Run is “A Glimpse of Heaven, A Taste of Hell,” and it’s not hard to recognize why. Taking place smack-dab in the middle of the sweltering summer, the race encompasses two states, three national forests, six counties and a 10,000-foot summit in Nevada. Just past the halfway point, he was settling into a nice pace. But as any ultra runner can tell you, there’s always time for things to head south, and at mile 60, they did. Landman’s stomach shut down, his muscles started cramping and he began throwing up every few steps in the dry afternoon heat. He was underfed and dehydrated, but couldn’t keep down food or water. For several hours he groggily stumbled along the dusty trail, dragging his feet and feeling on the verge of collapse. “I was ready to quit,” he says simply. As the sun set across the horizon of the Sierra Nevadas, Landman was losing hope and growing delirious with exhaustion. But with a bright array of constellations scattered across the sky and the piercing silence of the desert surrounding him, his mood slowly shifted and adrenaline started coursing through his veins again. After reaching the very edge of his ability to go on, he had somehow emerged in a strange, transcendent, almost blissful state of being. CERTAIN ATHLETIC GOALS are understandable, practical and even downright enjoyable, like honing a tennis serve or perfecting your downward dog. But what, exactly, possesses someone to want to run 100 miles without stopping? “I read about it flipping through a Runner’s World magazine, and thought it sounded like just about the hardest thing I could possibly do,” Landman recalls with a hearty laugh. LANDMAN’S ULTRA CAREER almost didn’t make it beyond the first race. Even with that joyous last-minute sprint, when he crossed the finish line at Tahoe—with a time of just under 24 hours—he vowed never to run another ultra again. In the ensuing days, though, he couldn’t get the experience out of his head. “Whenever I closed my eyes, I was on the trails,” he says. Within two weeks, he was online researching his next competition. 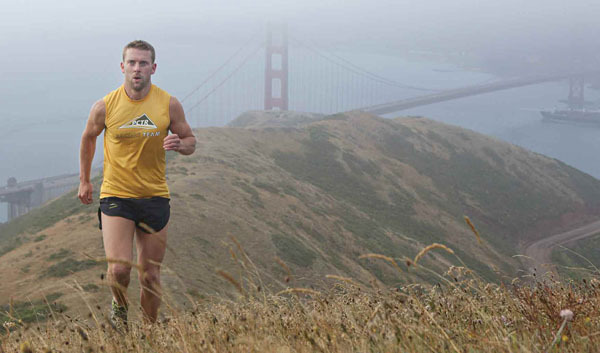 Landman won four of his first six races, even setting a course record at the Big Basin 50K (4 hours, 39 minutes). In 2010, he tackled the sport’s Holy Grail at the Western States Endurance Run, which climbs more than 18,000 feet, descends nearly 23,000, and traverses snowcaps, riverbeds and a seemingly unending series of sun-baked canyons with such names as “The Bake Oven” and “Devil’s Thumb.” Typically, as much as a quarter of the more than 400 participants don’t finish. The then-23-year-old, in only his second 100-miler, placed 16th. That’s not to say success has come easily. In the early days, Landman spent hours painstakingly poring over topographical route maps and picking the brains of his peers. He quickly learned that the advice about how “it’s not a sprint, it’s a marathon” becomes exponentially more valuable in ultras, which runners train themselves to separate into 10- or 20-mile minigoals to conquer. In preparation for those eternal runs, Landman’s weekdays begin with 3:30 a.m. “easy runs” of 10 to 12 miles through San Francisco’s Golden Gate Park. On weekends, he embarks on 50- mile excursions in which he equips himself with nothing more than a water bottle and a salt tab. When he and his wife Geri take hiking trips into the mountains, she will often drop him off at a trailhead and meet up with him 50 miles later in time for dinner. So what’s the payoff? Ultramarathoners aren’t looking for money or fame or glory; the prize for finishing Western States in under 24 hours was a silver belt buckle. For an overscheduled guy like Landman, the ritual centers him and lets him shut down his mind—which, somewhat paradoxically, often results in fresh perspectives and new research ideas. LANDMAN’S HOBBY, while closely related to his career in orthopedic surgery, might also seem somewhat at odds with it. His UCSF colleagues tease him about how he’s “just trying to build a network of patients,” and caution him, only half-jokingly, about subjecting his feet to an activity that could result in the debilitating injuries described in his textbooks. “There’s probably a healthy balance to this, but doing things in moderation just doesn’t work for me,” admits Landman, who cut a quarter of the weight off of his 225-lb. football frame in his first year of training. After Western States, he exhibited symptoms of rhabdomyolysis, a muscle-breakdown condition that can cause severe kidney damage. While he understands the risk of developing early osteoarthritis or hypoglycemia, he says that the joy he gets from the sport, for the moment, outweighs the potential repercussions 30 years down the road. His research at UCSF could provide insight into what damage will be done: This spring, the Clinical Journal of Sport Medicine is publishing an article he co-authored that looks at physiological changes runners experience during races. Bucking conventional wisdom, he found that runners who hydrated less—and, therefore, lost more weight—were actually more likely to succeed. He argues that the “drink plenty of water” mantra that’s been drilled into our heads vastly oversimplifies matters for ultra runners, and that factors such as electrolyte balance and blood pressure may be better benchmarks for good health than weight loss. In many cases, runners are disqualified from races if their weight drops by more than 5 percent. Landman hopes his article might inspire the entire community to rethink the rule that has been followed for more than three decades. Landman wasn’t surprised to discover through his research that ultramarathons attract a disproportionate number of recovering addicts. The sport is, if nothing else, rooted in extremes— that mix of heaven and hell, of unbearable hurt interspersed with intense physical euphoria. Speaking of hell, still remaining on his bucket list is the 135-mile Badwater Ultramarathon in Death Valley, where temperatures get so high that runners keep their feet on the road’s white lane markers to prevent the soles of their sneakers from melting off.